If you would like to pickup your purchase from our facility, please choose the "Local Pickup" shipping option during checkout. Please gives us a call before you pickup to insure that the item you purchased is in stock and available for immediate pickup. Our telephone number is 1-800-326-6880. Pickup hours are Monday- Friday, 10 AM - 4 PM. All items will be shipped via UPS ground unless otherwise requested. Please call us for expedited shipping rates before placing your order. Retail Customers who reside in the lower 48 States will receive free UPS Ground shipping on orders that have a subtotal of $300. 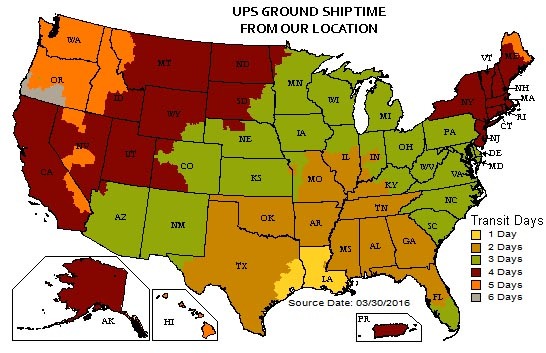 ATV Dealers who reside in the lower 48 States will receive half-price UPS Ground shipping on orders that have a subtotal of $750. Items will normally ship within 1 business day after payment approval. You will be contacted via e-mail or telephone in the event that one of your items is back-ordered.